Work with diverse Communities (Lohana Community North London) and (The Indian Cultural Association of Hertfordshire) for the past 20 years in various roles. The above two Associations’ aim is to bring together the fellow community members in celebrating the religious Hindu festivals, enhance the cultural, educational and sporting skills and create an environment where individuals can realize their potential. 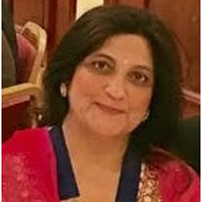 Sandhya is currently President of the Multiple District Lioness Club Golders Green. Lioness Clubs are part of Lions Clubs International, the largest service organisation in the world. With over 1.4 million members in 44,000 communities around the globe, taking a ‘hands on role’ in improving the quality of life in the local community and the wider world. Lionesses get involved in the Community on a Local, National and International level. Sandhya has been awarded twice with outstanding club leadership and dedicated service to the Lions International. On 24th September, 2016, Sandhya was selected for the International Women’s Pratibha Award (Best Raghuvanshi Pride of Women Award) for Community Services by Shree Lohana Mahaparishad, the mother organisation of all Lohana brothers and sisters residing across the world. The Award Ceremony was held in New Mumbai, India.